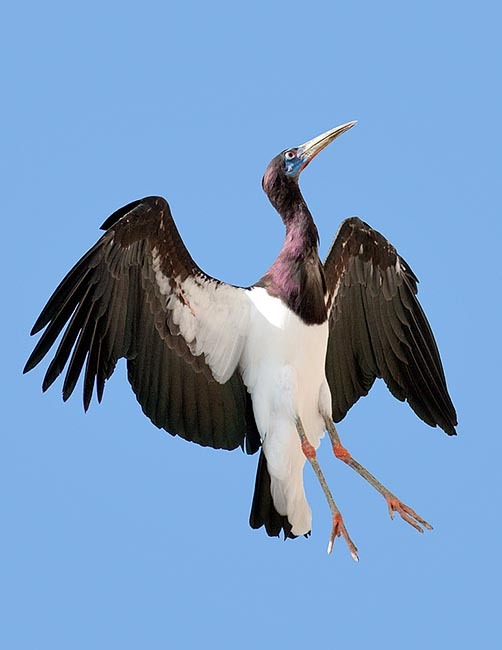 The unusual Abdim’s stork or White-bellied stork (Ciconia abdimii Lichtenstein, 1823) belongs to the order of the Ciconiiformes and to the family of the Ciconiidae. 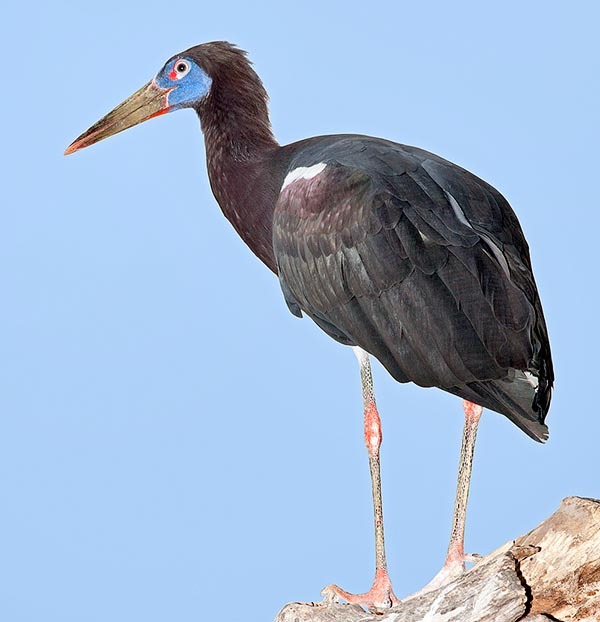 This bird can be considered as the African version of the European Black stork (Ciconia nigra) being practically the same in shape and colours. The dimensions, not always easy to evaluate when flying or isolated, are on the contrary sensibly more reduced but the distinction remains difficult, especially in the hibernation sites of the European populations where the two species do overlap. In Africa it is a beloved by all bird and considered a good omen and of good luck because its arrival coincides with the arrival of the seasonal rains and is therefore the forewarning for the countrymen in the preparation of the fields to cultivate. Being moreover a very common bird and absolutely not disturbed by the human presence, it is often seen grazing in the cultivated fields looking for large insects, close to the country- men themselves. Upon arrival from their infra-African migration, when the cultivations are not yet implemented, it loves much to go around among the same fields gleaning those fruits left behind from the previous cultivations and occasionally moving to a vegetal feeding, eating indifferently tomatoes, potatoes and legumes abandoned in the fields and integrating them, of course, with molluscs, frogs, lizards and small mammals. The scientific name Ciconia comes from the homonymous Latin term that rightly identifies the stork whilst abdimii recalls the name of the Sudan Turkish Governor, Bey El-Arnaut Abidim to whom Lichtenstein, the scholar who did classify this species, honoured this bird. The most common vulgar names are: in English Abdim’s stork; in Italian Cicogna di Abdim or Panciabianca; in French Cicogne d’Abdim; in German Abdimstorch; in Spanish Cigüeña de Adbim and in Afrikaans and in Endongondongo Lekololoane, Roba-re-bese in some local Bantu dialects. 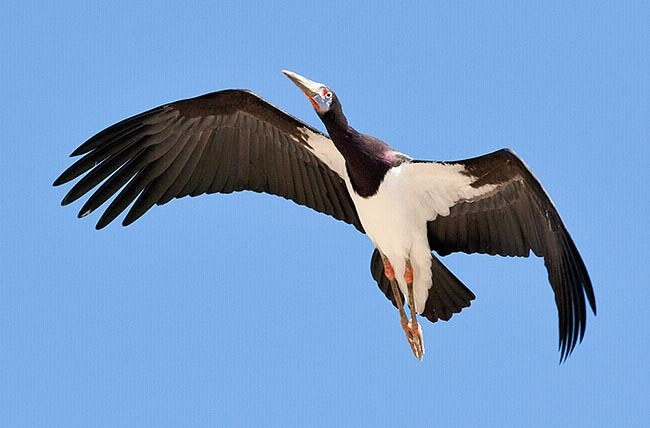 Abdim’s stork is an African species even if it is present in an isolated way also in the extreme south-west of the Arabian Peninsula, in the Yemen area and partially in the Hadramaout. In Africa it is diffused in two distinct areas: in the sub-Saharan belt, area frequented from the month of April to August during the rain season and where nidifies, with a major concentration in the eastern sector and with the southern limit in coincidence to the equatorial line. Being a seasonal migratory species, always within the continent, during the remaining months it hibernates in Austral Africa, ariving there in coincidence to the period of the austral rains and occupying mainly the south-western area that goes, in broad terms, from Mozambique and South Africa, up to Namibia. It will move slowly and will take some months to reach the hibernation zones where will remain up to late March, when will begin over again the ceaseless pilgrimage. 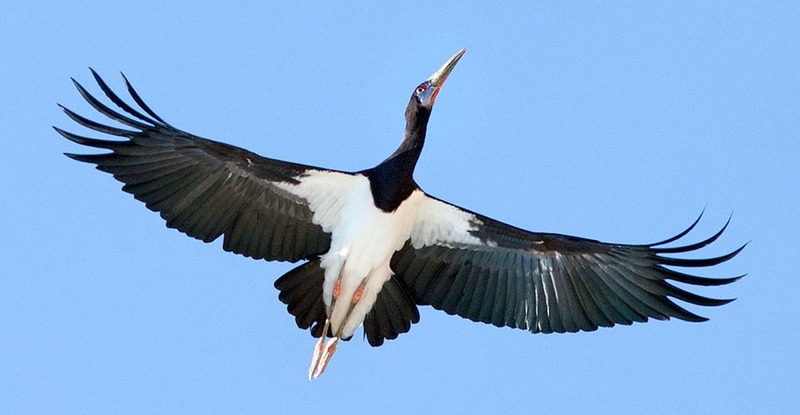 This stork loves the arid prairies, the cultivated areas, the woody savannahs and the borders of flooded areas of lakes and swamps where loves to rest during the day. It is not afraid of the man and is common also in areas at the limits of the urban settlements. It has a very social behaviour and during the feeding and the migration it gathers often in impressive flocks. It is quite difficult to see these storks alone or in relatively small number. Also for spending the night, it gathers in groups on trees and, where available, on rocky cliffs. It loves eating insects and its dedication to this food is often facilitated by the sudden invasions of grasshoppers or by the sudden fires of the grassy prairies preceding the rain season, opportunities of which takes greedily advantage gathering in huge flocks. The Abdim’s stork stands among the smallest storks between the members of this family. With its 70 cm of length, the weight of 1 kg and the wingspan of about 150 cm, it disappears if compared to the marabous (Leptoptilos crumeniferus) ubiquitous in Africa. The livery evidences a totally black colouration of the wing covering, of the back, of the tail and of the neck and a snowy white colour of the lower part of the body. The underwing evidences the dark remiges and the lower white coverts, unlike the black stork (Ciconia nigra) whose underwing is almost totally black. Beak and paws, in the adults during the nidification, of reddish grey colour with evident cere and part of the lower mandible of a marked bluish colour. The outline of the eye is lively red. The young do not have these small colourations but have a livery fairly similar to the adults’ one. There is no sexual dimorphism apart a smaller size in the female. Practically silent during all the year, it emits only rarely and when in the nest, acute guttural warning sounds. This stork often nidifies in scattered colonies as a confirmation of the high sociability of the species. It builds a robust nest that uses for years until habitable, on trees or on rocky cliffs but also on the roofs of the huts in the country villages. The nest is a large structure formed by strong branches at the base, then by twigs and inside covered by softer material that is continuously carried even during the brooding. It lays two to three very white eggs noticeably small if confronted to the size of the bird and the hatching lasts about 30 days. The chicks remain in the nest for about 8 weeks, fed by both parents. Like all arboreal birds, also the nests of this species may be predated by eagles, by large night predators and by goshawks. The Abdim’s stork enjoys a particular love and attention by the populations with whom it is in touch for the aforementioned reasons even if in Nigeria, as unluckily happens for a large number of birds, also this stork is subject to collection and illegal trade for its use in the popular medicine. It is not listed among the endangered species because the population is considered as stable.